Google+ What’s the potential benefit for your business? Will it be just another social networking site . . . ? Or with the backing of the Google brand and some added features and benefits, could this be the dawn of a new age of Enterprise capable social networking? Having already exceeded its maximum allocation of users within 2 days of its test launch, there is obviously a demand to see what’s new and where Google is going to go with this. After the failure of its first two attempts at social networking – Wave and Buzz – I’m sure Google is giddy with delight at this kind of initial response from users. But what’s new . . . Circles – Unlike facebook, Google is providing the ability to group your ‘friends’. As an example you will be able to group your work mates separately from your family, friends or high school buddies; allowing you to choose what and how you share with each group. Huddle – This allows a group chat functionality, instead of having several one on one chats. A particularly useful function for planning events or discussing a central topic with a number of people. Hangouts – A video chat function, which allows users to see who’s online and chat face to face. Similar in nature to Skype but integrated with your ‘friends’ lists. Sparks – Similar to an RSS feed, sparks will look for videos or articles it thinks you might like and if they take your fancy, have them ready for you to view anytime . Instant Uploads – There is nothing particularly new with the concept of uploading photos and videos to social media sites from your mobile devices. But with smart phones running Google’s Android and Google+, you don’ even have to think about uploading because all the hard work is automatically done for you. All you have to do is log in afterwards and publish for your ‘friends’ to be able to view. 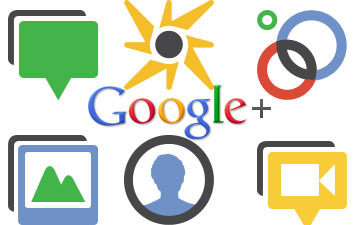 What does Google+ mean for the business world . . . Looking only at the basic functionalities as described above there are numerous possibilities for integration into the business world. With instant uploads you have your very own ‘live feed’ to your social media site keeping your ‘friends’ and ‘followers’ up to date by the minute. With circles you will be able to group users based on preference or practice thus allowing you to send targeted information or marketing materials. Sparks will prove to be useful with up to date media related to your fields of interest, which you may have otherwise missed, sent straight to your account. Unquestionably Google is targeting the consumer market with this new offering. But many industry commentators believe that there may be more to Google+ than meets the eye. With its collaborative tools and ability to build distinctly separated groups from the aggregate whole, many believe the fundamental building blocks exist for Google + to truly own the Enterprise Web, not just the Social. Google+ and +1’s. The coming effect on search engine results . . .
What is +1’ing you ask? Google is now providing the users of Google+ with the ability to recommend or refer a website, google ad, video or image. They are calling this action +1’ing. This provides users of Google+ with the ability to make or see virtual recommendations. The biggest overall affect that this will have is the return of search and ad results in Google’s search engine which will be annotated with the number of +1’s they have received. This will effectively provided users with the ability to gauge whether something may be of use to them simply by seeing whether their peers have previously rated it as noteworthy. While still only in a testing phase, the response to Google+ has been strong. But once fully released, will there be this predicted mass influx of users to make this the new Facebook? One thing is for sure, Google+ is definitely something worth keeping an eye on. To visit the Google+ page and read more about its features and stay up to date with its full release, click here.